This entry is part 11 of 10 in the series Best Restaurants in Belgium. From burgers to burritos, truffles to toasties, you can find it all in a food truck in Belgium. We share 9 of the best food trucks in Brussels and beyond. Food trucks have been all the rage in North America and the UK for more than ten years now. Belgium, however, was slow to catch on to this foodie trend. Despite having a great street-food culture in Brussels, the closest you could come to a food truck was a waffle van – until now. Over the past two years, we’ve watched the food truck scene explode in Brussels. With this year’s Food Truck festival, and weekly food truck lunches at the BIP, we are excited to say, the food truck trend seems here to stay, in Belgium. Today we want to share a few of our early favourites (although we’re dedicated to trying many, many more!) 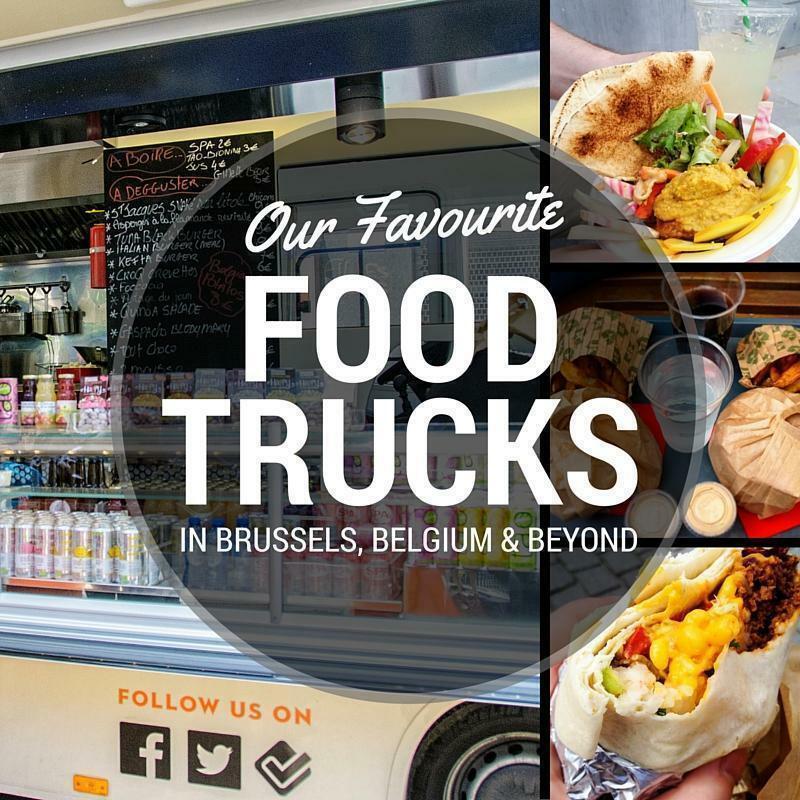 So, here are our current 9 Favourite Food Trucks in Brussels, Belgium, and beyond! Keep on Toasting was one of the very first food trucks in Brussels and it remains one of our favourites. We love Jean-Baptiste’s entrepreneurial spirit and positive social media presence. But most of all, we love his toasties! Keep on Toasting’s delicious toasties were one of Brussels’ first food trucks. Although I’ve tried them all (for you dear readers), I am still enamoured with my first love – the croq-veggie, with lentils and goat cheese. You can read all about this pioneer Belgian food truck in our first Keep on Toasting review. We discovered Urban Cosi at the Brussels Food Truck Festival, last spring. Urban Cosi, otherwise known as the Cosimobile, is the portable extension to the Restaurant Cosi, which has been a Chatelain staple for more than 20 years. 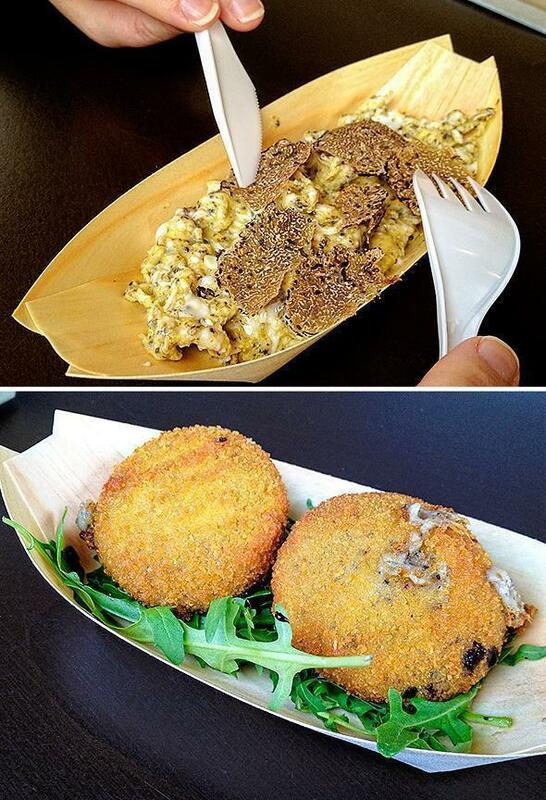 Urban Cosi is truffle heaven with croquettes and scrabbled eggs a la truffe! Urban Cosi actually won the award for best gourmet food truck. We’d have to agree. This adorable little retro van, churns out truffle-laden goodies, better than many traditional restaurants do. The scrambled eggs with truffle were deliciously unctuous and the truffle croquettes were a crispy mouthful of truffle heaven. This is definitely a high-end food truck to keep on your radar! It seems the vast majority of food trucks, making the rounds in Brussels, are featuring hamburgers. We’ve tested a number of them and, so far, our favourite is Urban Cook. 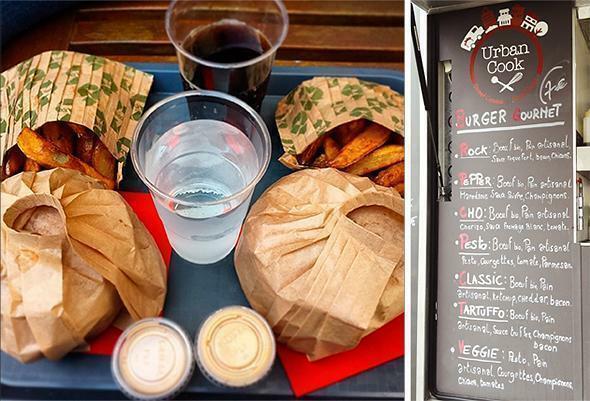 We discovered Urban Cook at the BIP Frunch and they are currently in our top 5 hamburgers in Brussels. I love their Rock burger, with Roquefort and bacon. Andrew is a big fan of the Classique, with cheese and we both enjoy the Tartuffo, truffle burger. The thick cut fries make a nice addition and all of the sauces are homemade. Urban Cook also has some of the best burger buns we’ve had in Belgium. Yum! We’re always on the lookout for good Mexican food, so when we spotted the brightly coloured El Camion Cantina Mexicana food truck, we had to give it a try. (It didn’t hurt that one of the young and energetic chefs was sporting a Lucha Libre mask.) It turns out, they are actually from Lille, but we’ve seen them in Brussels on several occasions so we felt they were worth mentioning here. Now personally, I wouldn’t call this ‘authentic Mexican’ cuisine, which is why I’ve actually labelled it as Tex-Mex. But that doesn’t mean it wasn’t good. The soft tacos were fresh and tasty and the burrito was hearty and made from scratch. They also have a variety of hot sauces available if you need to kick the heat up a notch (yes please!) We’ll be on the lookout for El Camion the next time we’re in Lille, and we hope they’ll head north to Belgium again very soon. 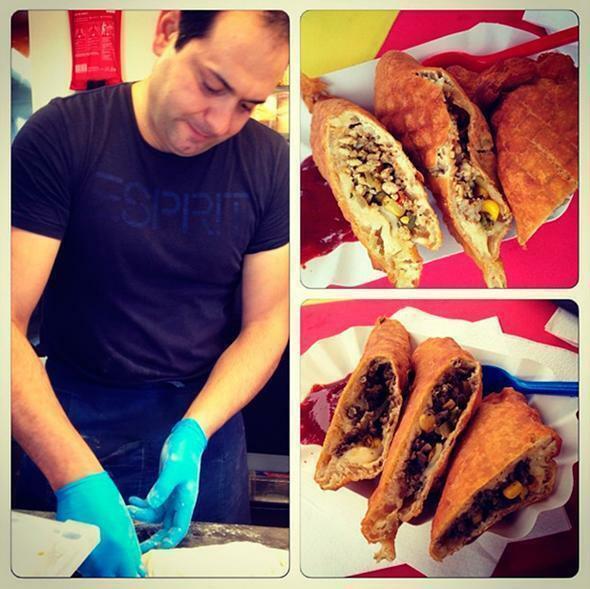 Sticking with the South American vibe, our most recent discovery was the Empanada King. (They don’t have a website yet but we hope it’s coming soon!) If you’re one of our newsletter readers, you may remember we mentioned finding the Empanada King in Tongeren last month. They are quite new on the Belgian food truck scene but we hope to see more from them. The empanadas are made from scratch and assembled when you order them, so they are always super-fresh. They are also large and hearty – one is a perfect lunch treat. While they have a variety of the typical Belgian frite sauces on hand, ask for the special spicy sauce and tell them CheeseWeb sent you. Between the Brussels Food Truck Festival and the BIP Frunches, we’ve seen a lot of Chang Noi the past few months. That’s fine by us! I adore their pad thai kai and each of their daily special curries have been fantastic. I particularly enjoyed their Massaman curry. Chang Noi is a little Thai food truck that packs a load of flavour! But my favourite dish from Chang Noi is, sadly, not regularly on their menu. In fact, it was my favourite mouthful of the entire Brussels Food Truck Festival, (and believe me, there was stiff competition!) It was a shrimp tartar, with lemongrass and chili, and it was heavenly. If you ever see it on their menu – order it. You’re welcome. 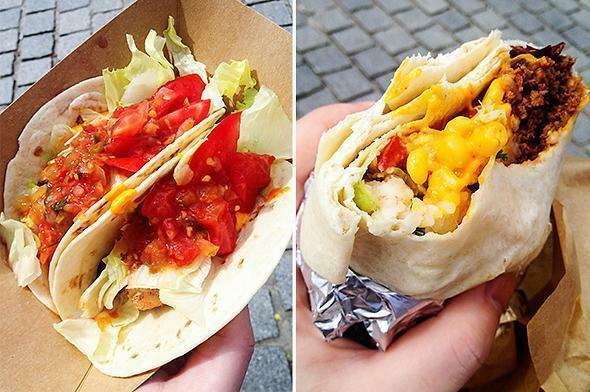 The Co-Kot food truck was another discovery from the Brussels Food Truck Festival. This gourmet food truck is actually run by the folks behind the gorgeous MIM brasserie, among other restaurants. While Co-Kot does sell burgers (among other things, like scallops and croquettes), they are not your typical beef patty on a bun offerings. 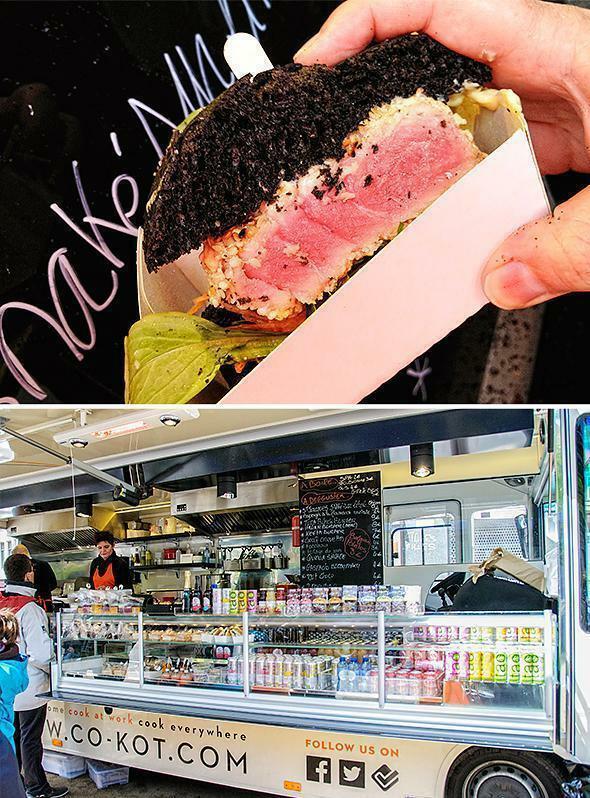 We spotted a Moroccan Kefta burger and an Italian burger, but I had to try the tuna ‘black burger.’ The tuna was perfectly seared and not overcooked inside. I’m not sure what made up the black bun, but it was definitely a tasty combination. This was a healthier option than a traditional burger and I would definitely choose it again! We discovered the Vegan Routes food truck (which is actually a double-decker London bus) at the Brussels Summer Festival. We couldn’t resist the tasty smells wafting from inside. Like El Camion, Vegan Routes comes from abroad. The bus originated from London (while its owner is French) and it spent the summer touring festivals around Europe. We’re hoping they make a return visit. As you can probably gather from the name, Vegan Routes offers healthy vegan foods and juices. Their fresh lemonade was a welcome treat on a hot day and I gobbled down the hummus with fresh heirloom veggies. Food Trucks normally tend towards fried and heavy foods, so Vegan Routes was a welcome change, we could feel virtuous about. Check them out at their regular home, if you happen to find yourself in London. While Le Petit Nuage isn’t exactly a food ‘truck’ we can get behind their eco-friendly, initiative. Besides, after all of those great food trucks, we need a little sweet treat for dessert, no? This traditional ice-cream cart is not only eco-powered, but the ice creams are also organic and artisanal. You can smell the freshly made waffle cones wafting through Parc Leopold throughout the summer months. Follow your nose to some of the best ice cream in Brussels, always served with a smile. 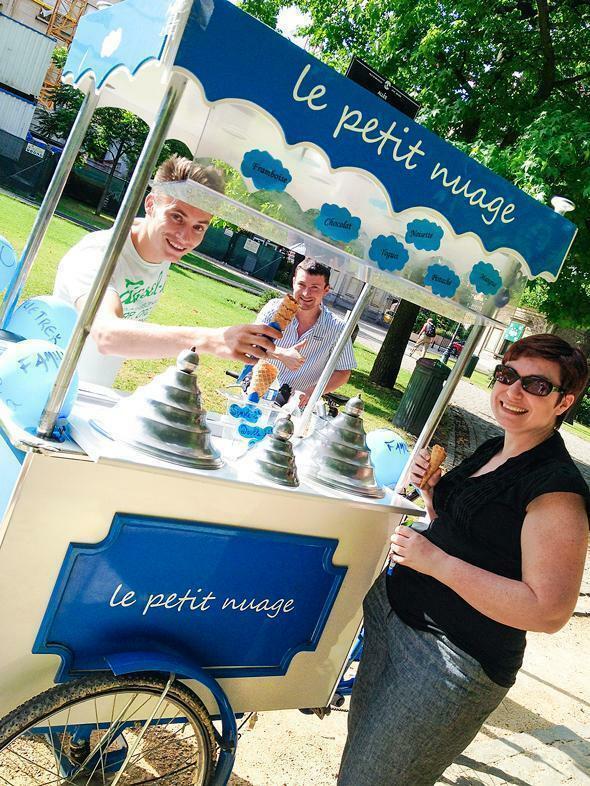 Pedal-powered organic ice-cream from Le Petit Nuage. With news of permanent Food Truck parking coming to the capital, and more food trucks arriving weekly, we can’t wait to see what Belgium’s food truck future holds. Do you have a favourite food truck we should try? Let us know about it in the comments. If you’re looking for more great foodie articles, check out our Restaurant Reviews for suggestions in Brussels, elsewhere in Belgium, and beyond. 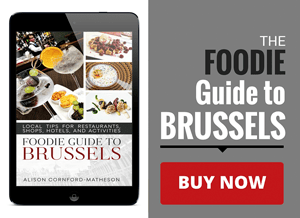 Or pick up a copy of our book, the Foodie Guide to Brussels. More than just a restaurant guide, we’ve shared the best Belgian dishes, shops to buy quality, locally made products, and even museums and festivals for foodies.